If you have a version of Peachtree or Sage 50 not listed here, contact us letting us know what your specific version and year is, so we can see what we can do! Its just a easy drag and drop to import! Easily link existing AyaNova and Peachtree / US Sage 50 records together so you can synchronize and bill out. Linking is ideal if you have many pre-existing items in AyaNova as you can link them to QuickBooks records without losing their historical data as you would if you started with newly imported items. And you can Auto-Link all items with matching names with one click! No problem! With PTI you can link and import on the fly, as well as bill out the part at a special price. When PTI displays the list of workorders that are ready for invoicing, it will advise you if anything in the billable workorder does not have linked objects (i.e. 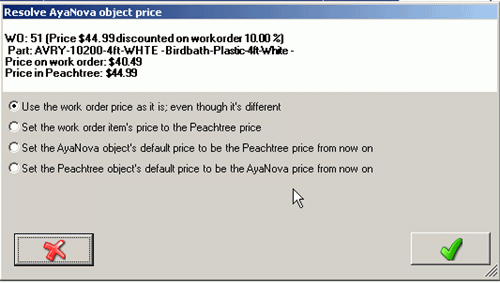 the client is not linked between AyaNova and Peachtree, etc) or if a price in Sage 50 is different than that in AyaNova so that you can conveniently change or accept it before invoicing.